Ooh I need to make my all time favorite comfort food and bring it over. Broccoli-cheese-rice casserole. Peanut and I can clean out the entire dish! I’ve also made Leah’s (Sohowsitaste)broccoli pesto pasta before too that’s yummy. We have a standby broccoli casserole recipe that we go with every christmas and thanksgiving. The family-sized-including-about-10-servings-of-leftovers version is 3 cups cooked white rice (from 1 cup of the bagged stuff), a smallish container of heavy cream, (a pint, maybe? 1/2 and 1/2 works also.) a large can cream of chicken soup, 2 lbs cooked broccoli, and loads of the cheese of your choice. (1 cup of sharp cheddar is nice here). 350 for 30 minutes, and top with crumbled Ritz crackers. We’ll eat off that for a week. Oooh, I’ll have to make these sometime. I bed Elliott would like them. PS. Have you tried a Broccoli Quinoa Chicken Casserole? I’ve seen various recipes floating around, and I finally made it. So good! I’m a big fan of anything with panko. 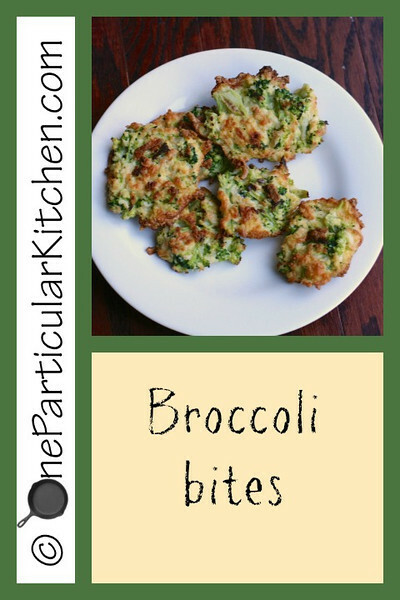 These broccoli bites were delicious. Tried them last night. Thanks for posting! These turned out a little dry for me – any idea how to make them a little bit more moist? Maybe another egg? The mixture should be fairly wet when it comes together.